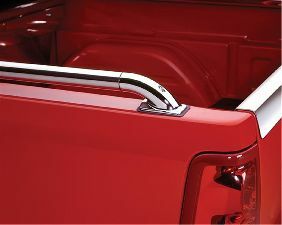 Showing 1 - 10 of 29 Products for Truck Bed Side Rail. SERIOUS STRENGTH: We get it. You do not want Siderails that try to look tough but have no purpose. BACKRACK(TM) Siderails are industrial grade and designed for trucks that push the envelope of on-the-job abuse. 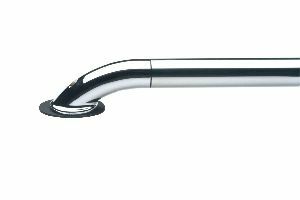 Heavy gauge HRPO tube is fully welded to an angular base that runs the full length of your truck bed. We expect you to overload your truck. BACKRACK(TM) Siderails are ready to handle whatever you bring to the job site. RUGGED GOOD LOOKS: If it wears the BACKRACK(TM) brand name it has to be work ready, but it can still look good while getting the job done. 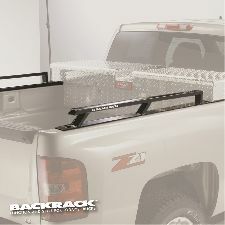 BACKRACK(TM) Siderails are designed to compliment the angles of our Cab Guards. Siderails install with or without our Cab Guards and are fully compatible with Crossbed Toolboxes. SIMPLE NO DRILL INSTALLATION: Drop them on and bolt them in. It is almost that simple. Once you secure the custom Stake Pocket Bolts into the stake holes, the Siderails drop into the pockets over the bolts. Turn down the nuts with a ratchet, and finish the installation by inserting the plastic caps inside the stake holes to hide all the fasteners. Very slick. TOOLBOX FRIENDLY: BACKRACK(TM) Siderails are available for both 6.5 ft and 8 ft bed lengths. The Tube Rail is available in two configurations: the FULL RAIL, which extends the full length of the truck bed and the TOOLBOX RAIL, where the Tube Rail stops short to accommodate the insertion of a cross bed Toolbox. NeveRust Stainless Steel. Easy no drill installation via stake pockets. Handy Pop Up Tie Downs have four tie down locations to handle any type of truck cargo. 500lb. Tie Down Strength. 1 3/4in. Tube Diameter. FORD F150 SUPER CAB/SUPER CREW-5.5FT BED. NeveRust(TM) Stainless Steel. 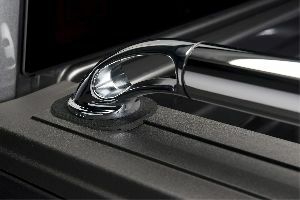 Black powder coated rail for extra durability. Easy no drill installation via stake pockets. Solid die cast construction allows for 1000 lb. tie down strength. PRICED RIGHT!!! 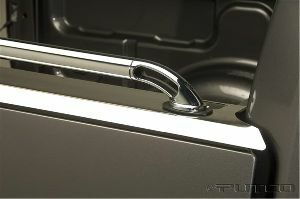 GM Official Licensed Product.